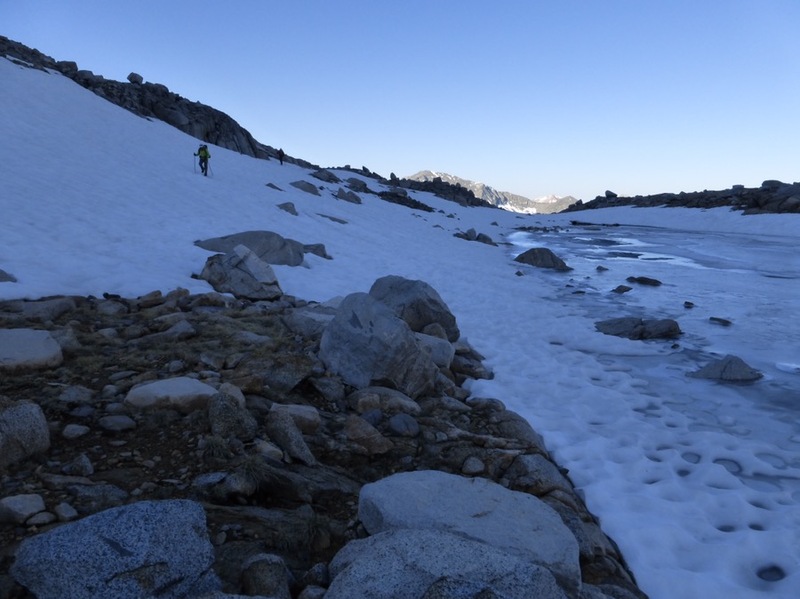 Today started off with our regular 6am start as we hiked cross-country up towards the intimidating Snow-Tongue Pass. On the way up, we were surprised to see some people camped. 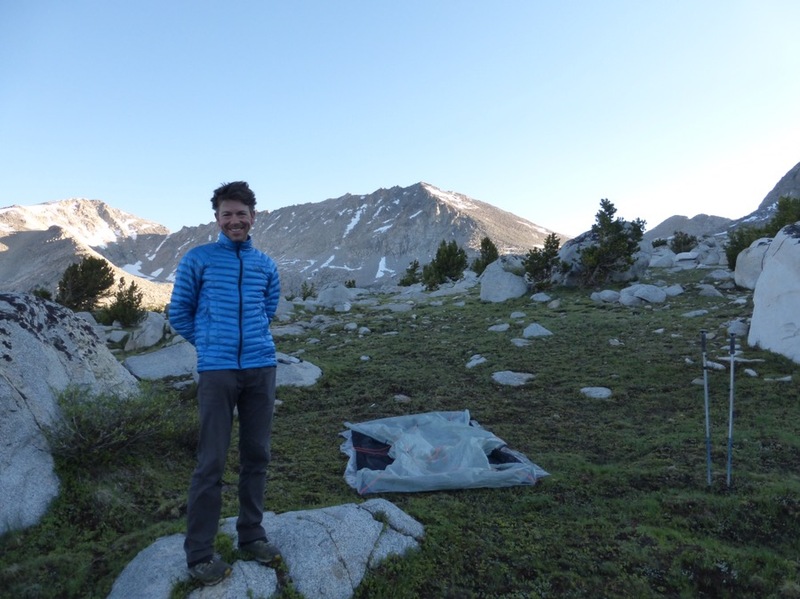 Two guys were doing a section of the Sierra High Route and another guy, named Ulrich (originally from Switzerland, now in LA) is doing the whole SHR. He is the first complete SHR hiker we’ve met. 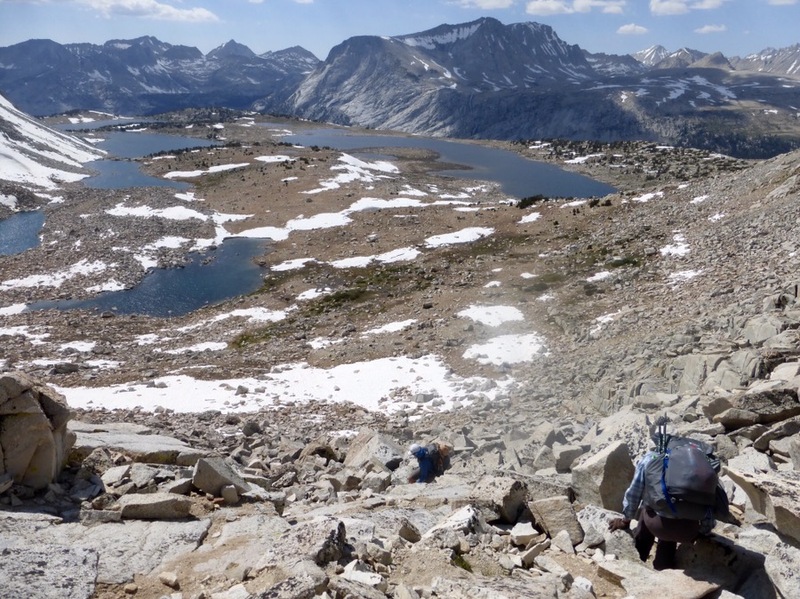 We compared some of our experiences, and he had the exact same harrowing experience that we had on Potluck Pass (Day 5). He said he almost quit after that experience as well. It really felt good to hear someone (outside our group) confirm that there didn’t seem to be another way over that pass and that it was terrifying. 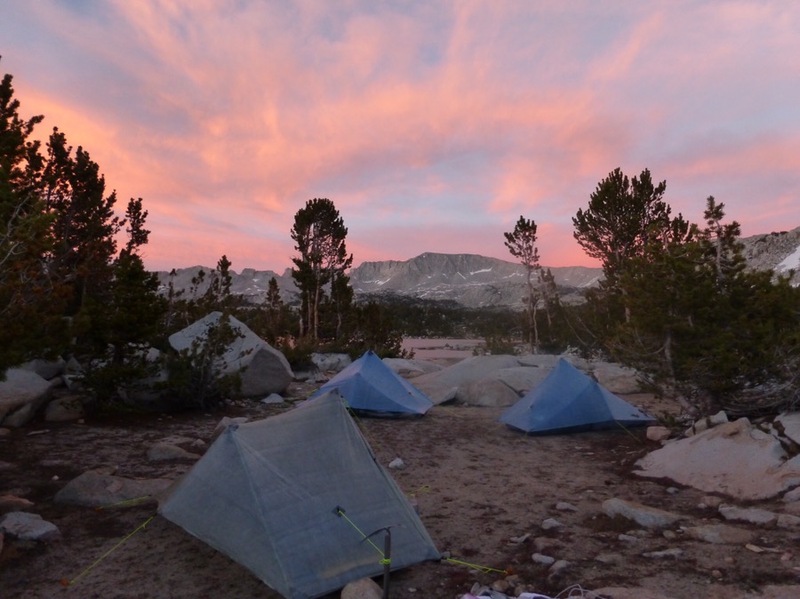 Morning photo of SHR hiker, Ulrich. The guys flew up the pass like it was a minor hill, which really doesn’t bother me because I know I’m a rookie at this, but it is impressive to watch. Rockin’ can go up and over this terrain with ease as well, but she is so patient to tolerate the pace of myself and Why Not. Why Not & Rockin’ hiking up to Snow-Tongue pass. When we got to the top, we knew the tough part was the descent. Snow-tongue pass (12,200ft) is known for what the guidebook author, Steve Roper described as, “horrible endless talus.” and, “The terrifying part of the view is the immediate foreground, where acres of shattered rock drop precipitously down the escarpment of Glacier Divide.” We all got to the top at the same time. It was odd and unnerving to have so many people up there at the same time in a cramped space trying to find the safest way down. Rockin’ (right) and two of the guys (center) working their way down. Ulrich took the lead and was soon low enough that we couldn’t see him until he popped out safely on the snow at the bottom. 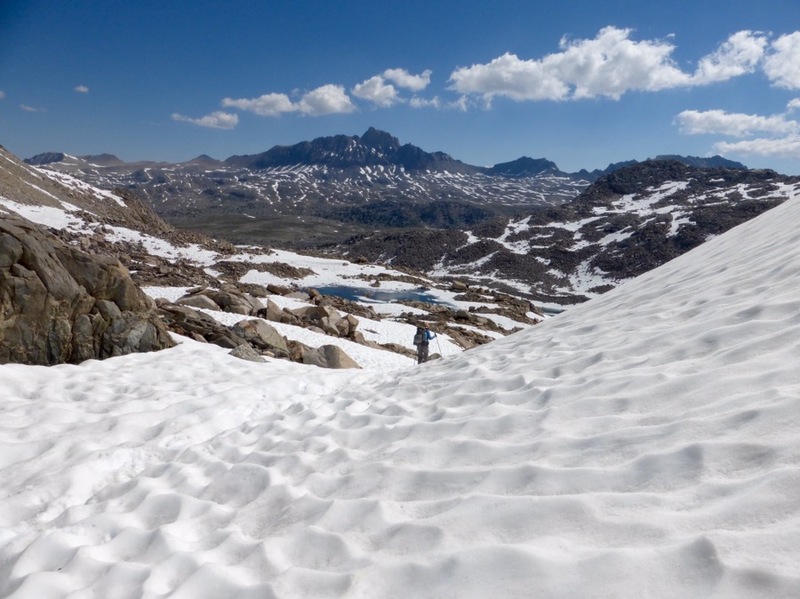 This pass is usually all boulders, but the snow made for more limited choices. It was quite steep and there is always worry of what’s under the snow and how thin it may be. 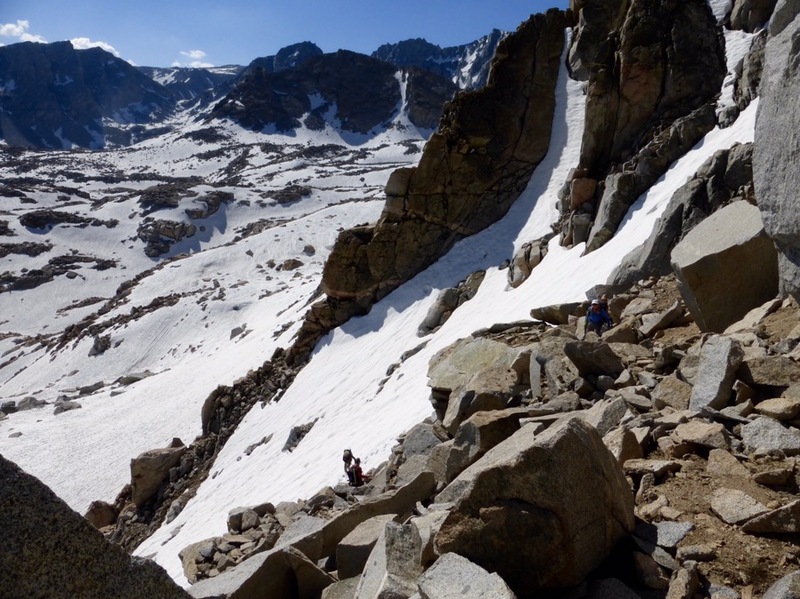 The other two guys took a route that was slightly different and took to the snow (my preference) higher up to avoid more of the boulders and loose talus. 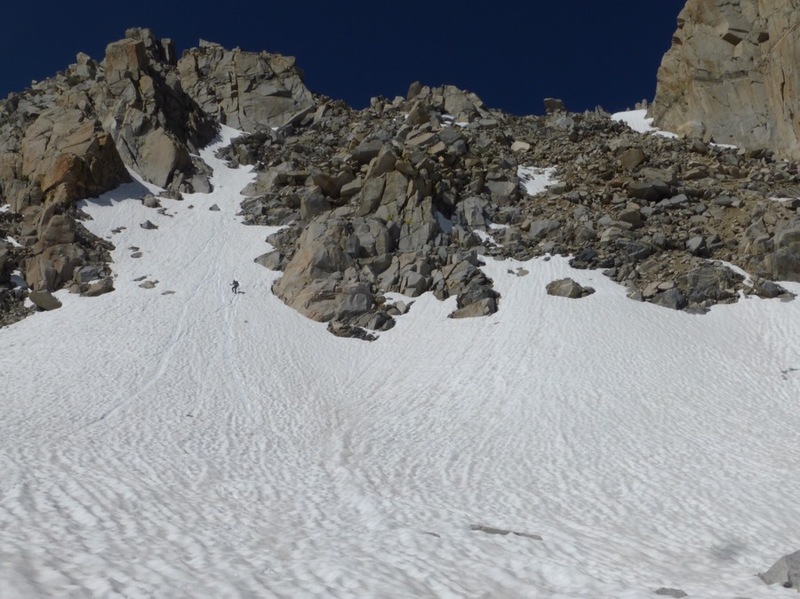 I ended up choosing the snow once we got low enough (I still have my ice axe and we all have microspikes) while Rockin’ and Why Not took more of the rocks down before getting on the snow. Looking up as Rockin’ works her way down. From there, we thankfully still had pretty firm snow to continue on the snow where there usually is the endless boulder field. 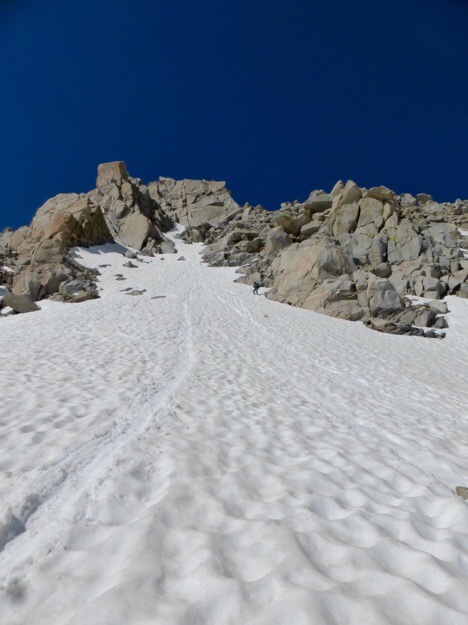 Yes, this is a benefit to hiking the SHR early season, and it does seem to save time, but so far, is evened out by the extra time the snow costs us in other instances and I personally haven’t seen it to be a major benefit as many would think in avoiding time consuming boulder hopping. Hiking north from Snow-Tongue Pass. Rockin’ in her element when we did hit the boulder field. Today was nice because we got to spend a lot of time on relatively level hiking in fairly smooth terrain. 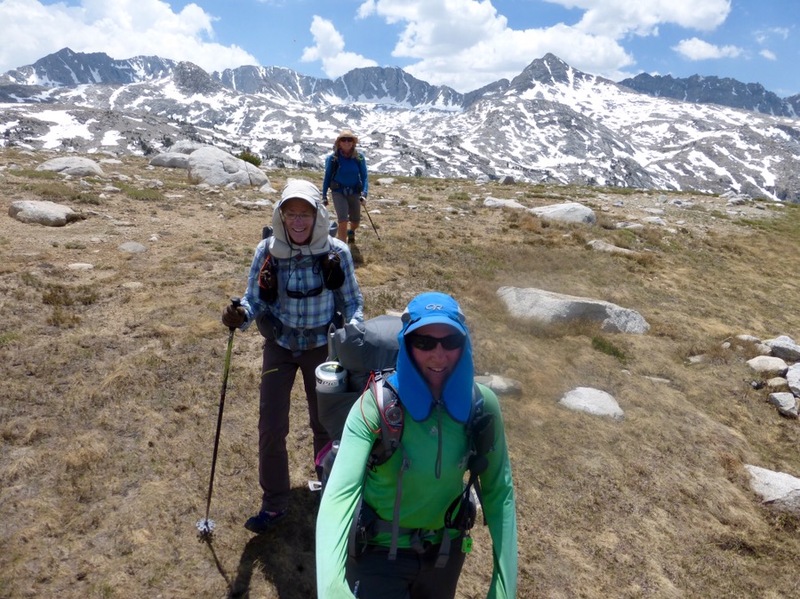 We hiked across Humphreys Basin, passing many lakes, tarns, streams, and marshy areas. We seem to be right at the height of the snow melt, so much of the ground has yet to absorb this year’s melting snow. Looking back across the basin at the snow covered mountain range we came over was pretty cool to see. Yes, I have a love/hat relationship with the hat. Our next pass was Puppet Pass. It’s a relatively smooth pass thankfully. Cutting across the basin (and everything else), the guidebook author, Roper, intentionally gives limited direction as this is intended to be a route where everyone just goes the way that best suits them. We are still working mostly with map and compass, and we are doing pretty darn well, but I’m definitely the one that gets the most impatient with the time it can take to continuously stop and reassess and use trial and error to figure things out. I do agree that it’s part of the essence of being on the SHR to go with map and compass, but I need to probably develop more patience in using trial and error rather than just easily checking the GPS to confirm if we are right so we aren’t wasting time and energy. 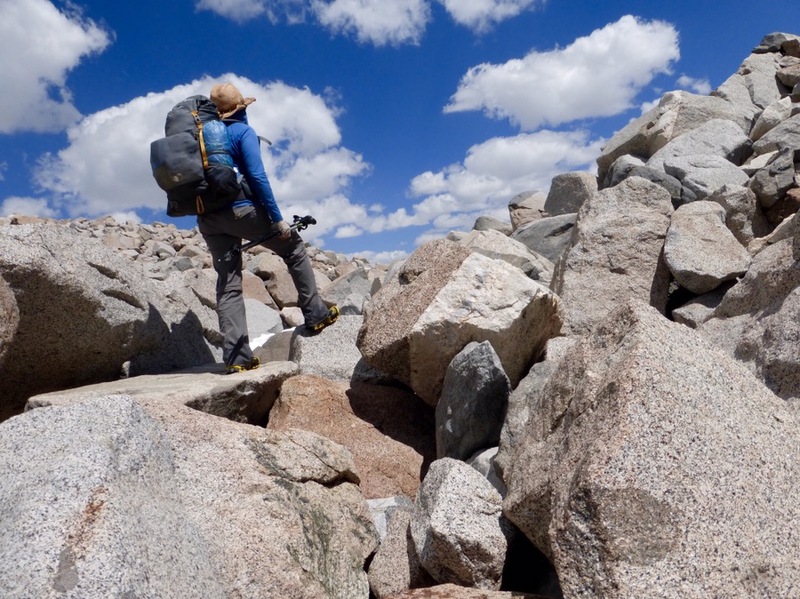 Once up on Puppet Pass, it was a ton of boulders to get down. Although I still don’t like it, I am getting more fluid with the boulder stuff, and it feels good to overcome those fears. A few times today, we needed to rock hop for awhile either over water or just a pile of large rocks. I found that I’m keeping up with Rockin’ a lot better on the rocks than I had and I’m pretty darn proud of it. Rockin’ & Why Not descending Puppet Pass. One of the purchases we made in Bishop the other day were grippy bouldering gloves. Well, they were $2.50 gardening gloves, but they work great! The rock on this route just cuts up hands and this was a great solution! They may only last this leg, but we know we can easily get a new pair in Mammoth if we want. 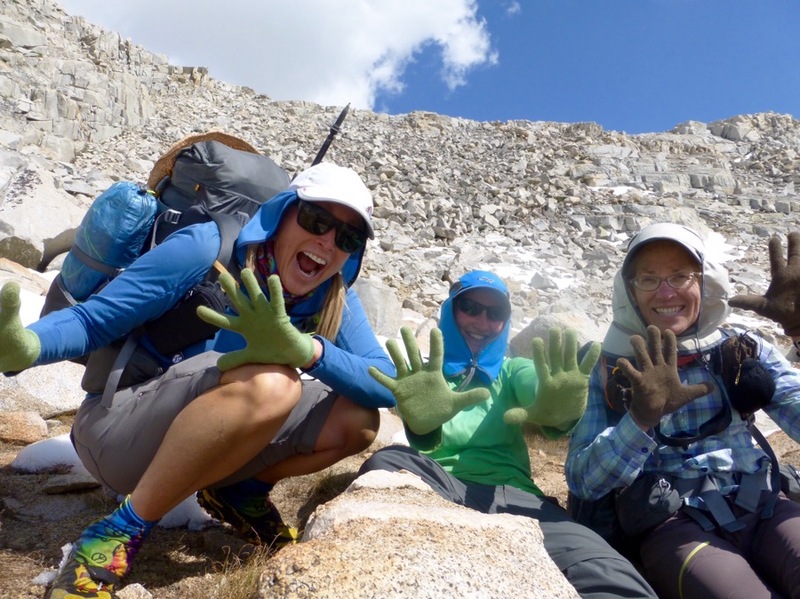 We love our gardening/bouldering gloves. 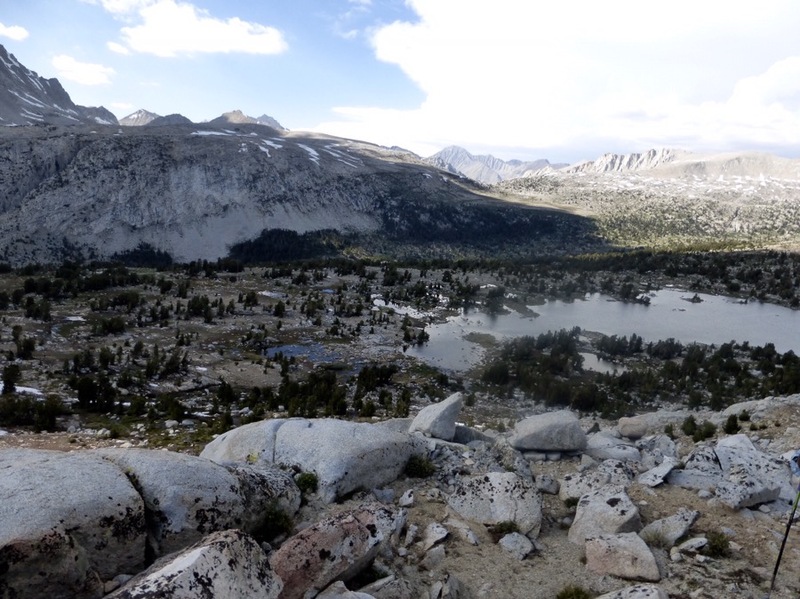 After completing Puppet Pass, we got to go across some more nice terrain as we hiked along Puppet Lake to then have our final descent of the day down to Elba Lake. View looking down on Elba Lake. 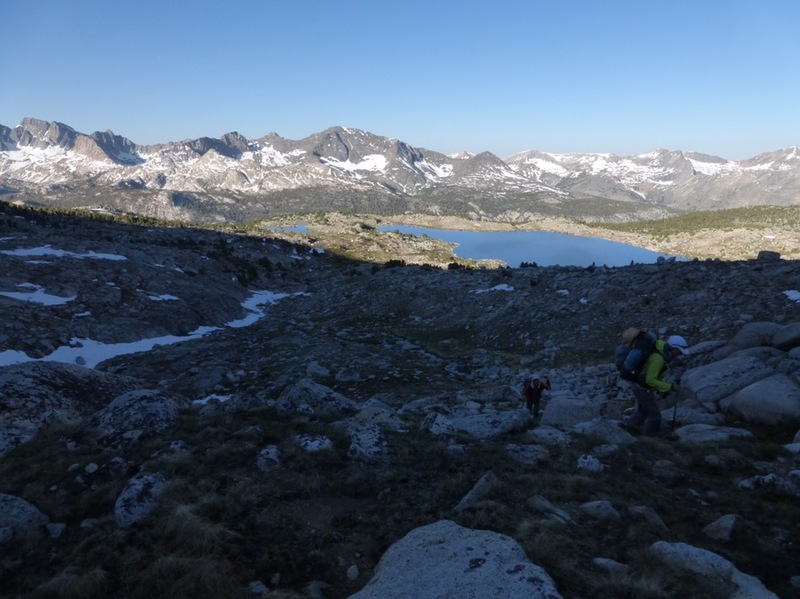 The guidebook mentions a nice gradual down to take to Elba Lake, which of course, is covered in steep snow and leaves us with more boulders to down climb. We climbed down to a point that it seemed ok to take the snow the rest of the way down. I was leading and we’ve been very cautious with the snow all day. It’s right on the verge of being thin enough that we shouldn’t walk on it. 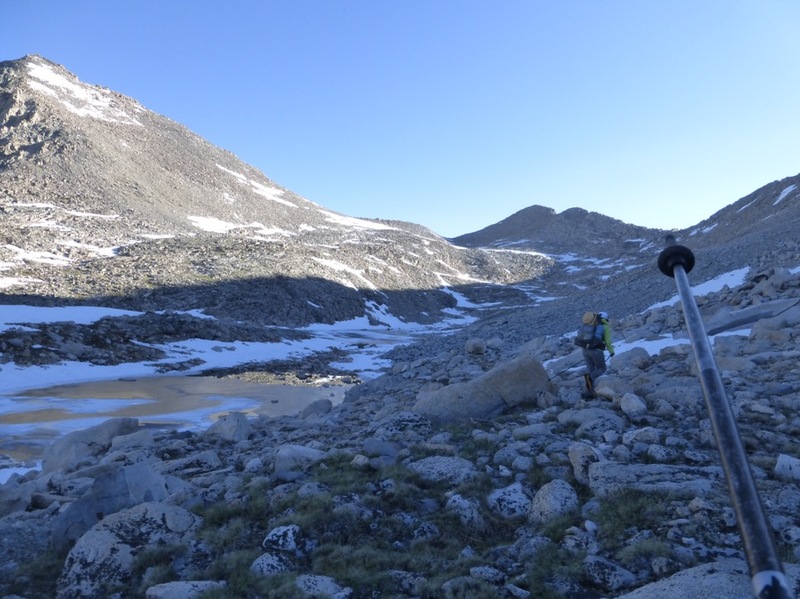 We have been especially cautious to avoid snow in boulder areas where we could fall into no mans land. Well, in this case, I mistakenly thought we were on a grassy harmless slope about 20yards long going downhill. I took two steps onto the snow with Rockin’ right behind me, and with no warning at all, the snow caved and I was waist deep in it. Apparently, we may have been between boulders. It was the mother of all postholes. Good news was that I didn’t get hurt. Bad news, the bottom of one of my trekking poles snapped. Good news, I didn’t get hurt. We continued down to Elba Lake and found a great spot to camp that was sheltered, but also near the lake. I was pretty darn proud that I figured out a way to break off the broken section of my pole with the tip so that I could wedge it back on the pole to possibly work for the rest of this leg. We got to camp early at 5:30pm, and I was hopeful that I’d get to watch a show, but I ended up being too tired by the time I caught up on blog stuff, dang. Oh! Other than our first night, this is the only night so far that we’ve had relatively dry shoes at the end of the day! I will be indulging in that moment tomorrow morning when I put on warm dry shoes. And wow, am I happy that you’re ok from your mother-of-all post holes! <3 Y'all are doing amazing! Why Not’s great idea! Good eye! Yikes about the person-sized posthole!! Glad you still came out with dry shoes, though. Did your pole still work okay for your tent? Craziness! I’m glad everyone is safe and you all are getting in your groove. Yes, only the bottom broke and the rest was plenty tall for the tent. When Rockin broke hers she realized that the umbrella with a rock under it is the perfect back pole. Warm dry shoes, now that sounds good. Don’t worry about the hat, it provides way more benefits than you’d think. I changed over about three years ago and hate it when I look at it but love that I get so much protection from it. That post-holing thing sounds a bit scary. So glad you are OK. I have a set of the Fizan poles and got them because of you and Rockin’. You can get a pretty good deal on them at Massdrop. Check it out. Nice catch Goal Tech on the Ice Axe tie-out. Got it, might as well use it for something.